Recently I found myself enmeshed in a lengthy Facebook conversation with other citizens of our home town on its “What’s Happening” page. Our teacher’s union has authorized a strike after working since August without a contract and negotiating since February. This is a hot topic in Illinois, a state that is so poorly managed that we have the worst credit rating in the country, and a state that does not do its share to fund public education, putting an overwhelming burden on property owners. We rank last in the percentage of funding that comes from the state, according to a 2016 U.S. Census report. So I was pleasantly surprised at the amount of support for teachers from those who were posting. I find myself revisiting my school district’s strike in 1998. None of us wanted it, either. We wanted a fair package and chose a strike as an absolute last resort. 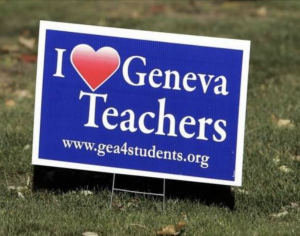 I believe that’s true of Geneva teachers, too. No one really wins a strike. And I find myself worrying about our nation. We say kids matter, but we don’t walk our talk. Teachers are overworked and underpaid. When our country is so deeply divided, when we face such extreme challenges in an unstable world, a robust citizenry capable of critical thinking becomes even more essential to our future. When will we invest in education, in professionalizing teachers and their pay, in improving ongoing professional development for those teachers, in removing obstacles like overreliance on standardized tests? How can we fully develop the potential of our students, who are our future, if we don’t? Previous Previous post: Why Can’t He Remember What He Reads?!! !